I can not put into words how much I love this book. I can confidently say that Love and Other Words is my favorite book so far for 2018! And I have a feeling it will also be one of my top 3 too. I just love it that much. The last two books that I have read from Christina and Lauren have been absolutely amazing. These two just keep writing the best books! Do you believe in soulmates? I do! I am such a sucker for romance novels about soul mates too. Especially second chance ones. Sometimes when I read an amazing book, I have a really hard time writing a review on it. LOL I wish I could just say, "read it! I promise you are going to love it too!" So here is my review, and hopefully, without any spoilers. Love and Other words is told in in THEN and NOW. I know that sometimes that can be confusing, but it really worked this time. I looooooved the THEN. I love how Elliot and Macy meet. That closet is the cutest thing ever. I wish I had one growing up along with an Elliot too! LOL I love watching their friendship grow into something special as they got older. You could just tell from the very beginning that they are meant for each other. Soulmates DO exist. My heart ached while reading Love and Other Words. I was an emotional mess. One minute I was swooning and the next I was crying my eyes out. When you find out why Macy is mad at Elliot, you will understand. Your heart will break for her and you will be a hot mess like me. Ugh! I am tearing up right now just thinking about it. 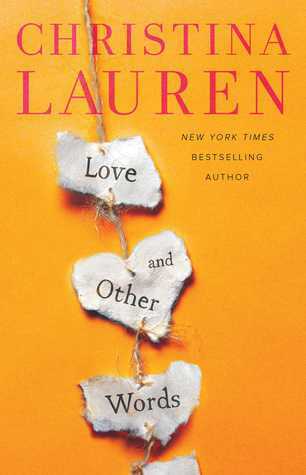 Love and Other Words is a book that will stay with you long after you finish reading it. It's a type of book that will still make you emotional every time you think about it. It is also a book that I will recommend over and over again. Christina and Lauren, you ladies have outdone yourselves. To say that this book is amazing, is an understatement. Keep writing, and I promise to keep reading your books and recommending them.